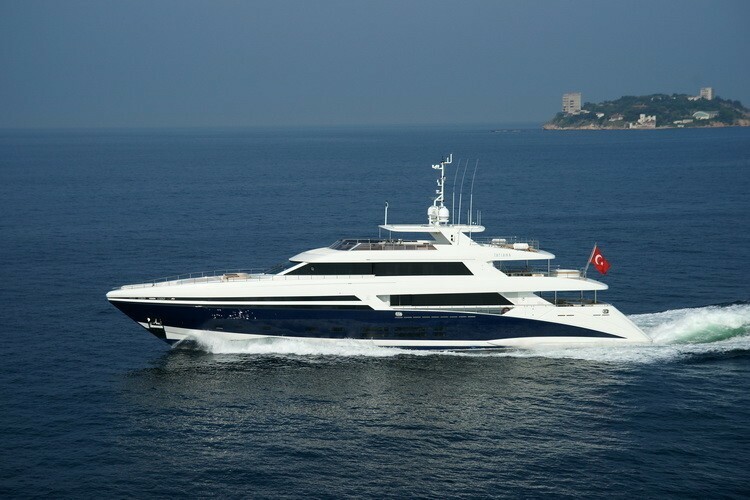 Superyacht TATIANA is a 45m (147.6ft) stunning vessel built by the well-known Turkish shipyard Bilgin Yachts and launched in 2011. 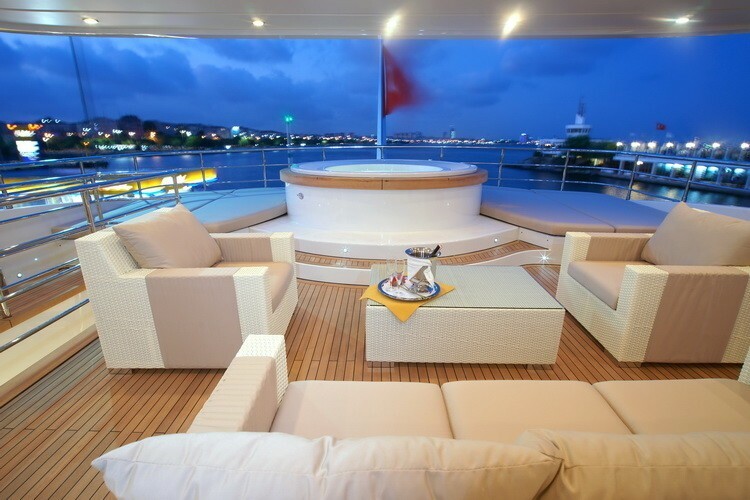 The Bilgin Yacht TATIANA's exterior and interior were designed by German architect Joachim Kinder and her interior was created by Septemar Yacht Furniture. 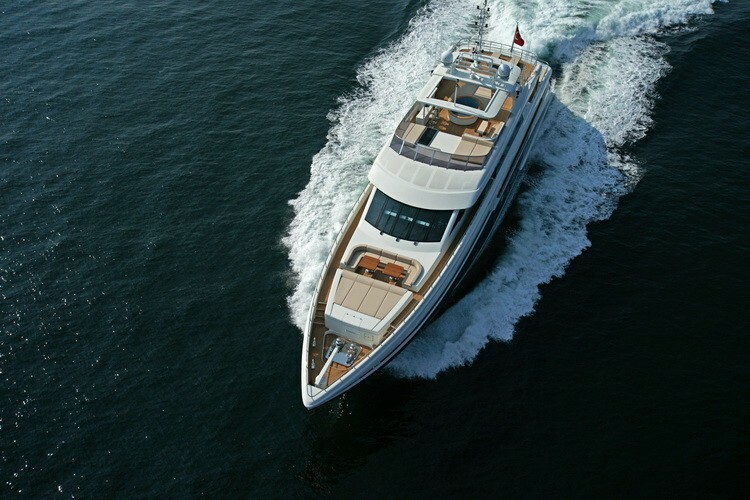 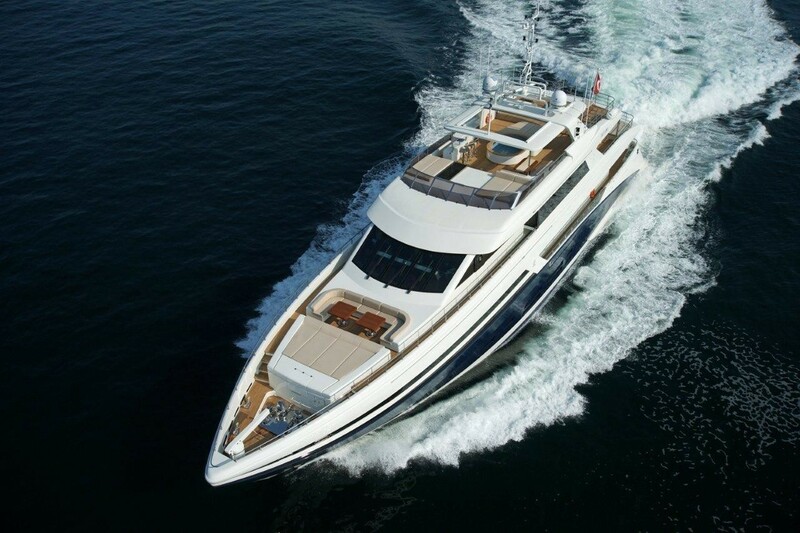 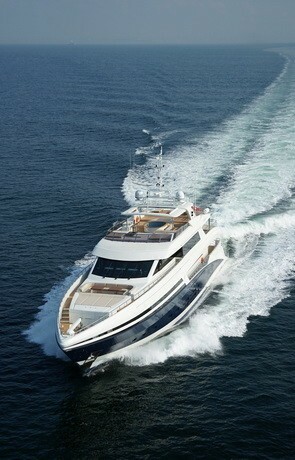 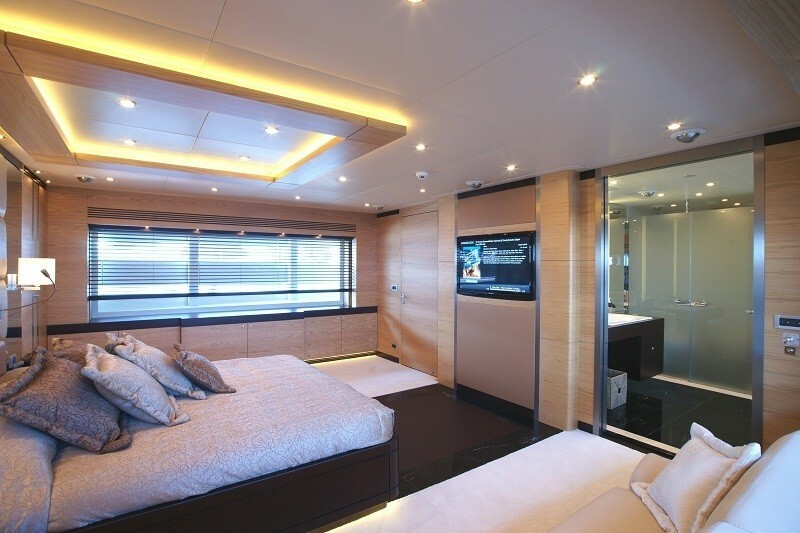 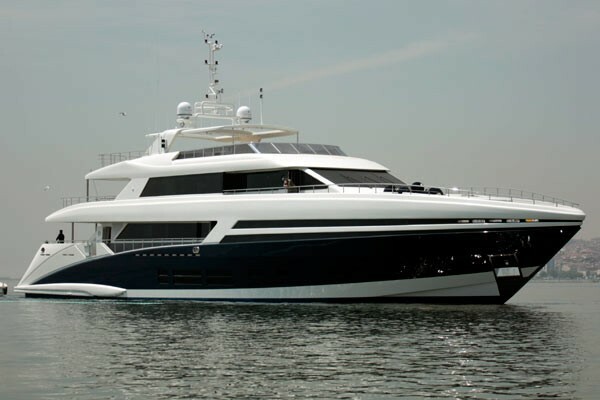 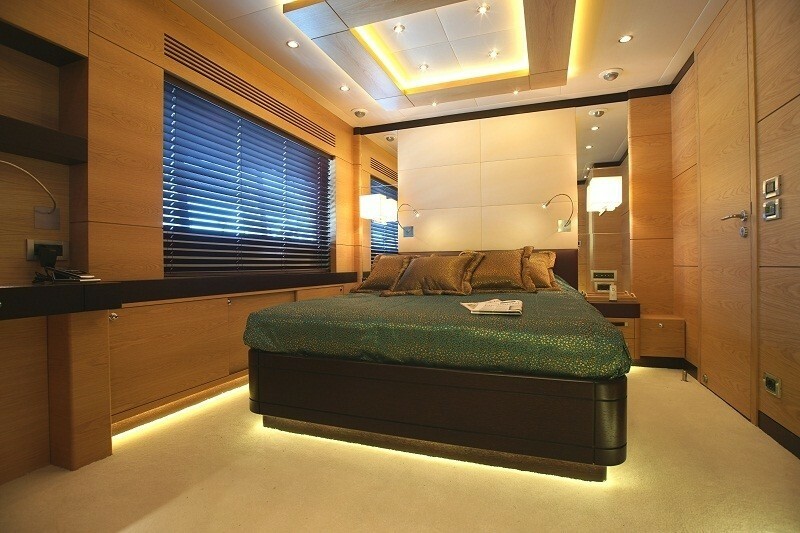 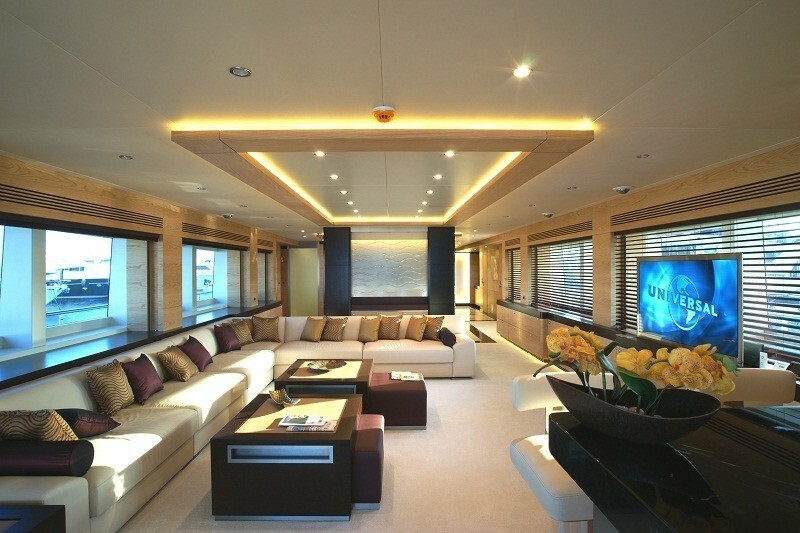 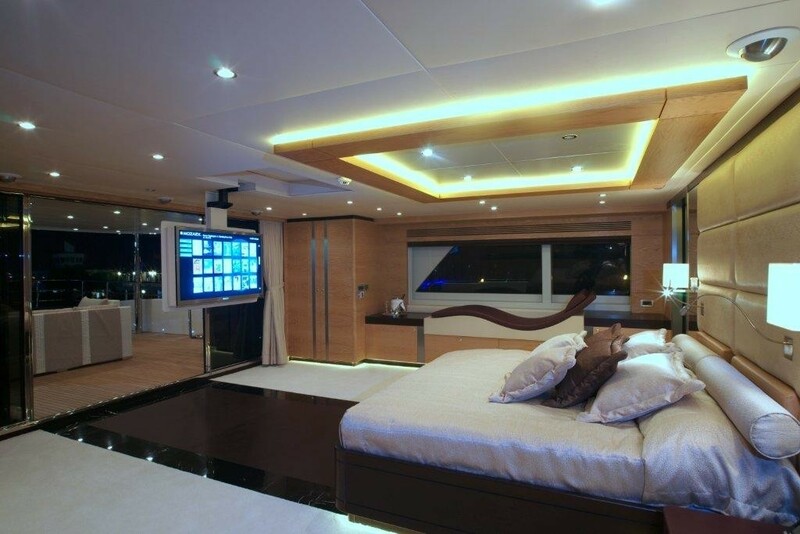 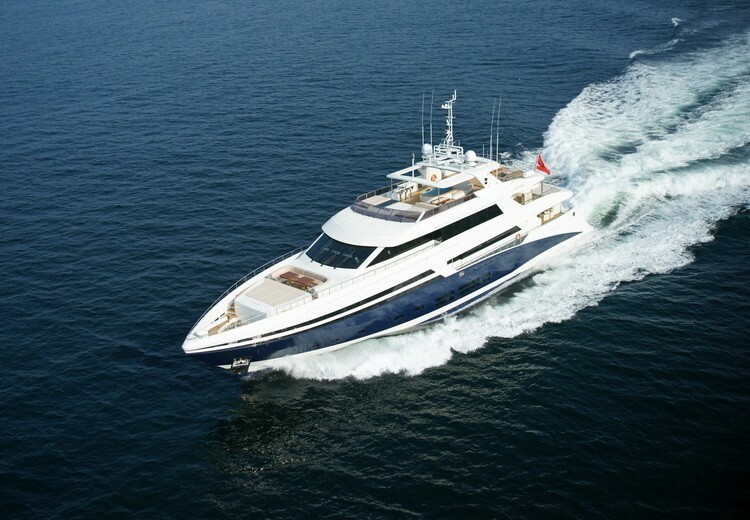 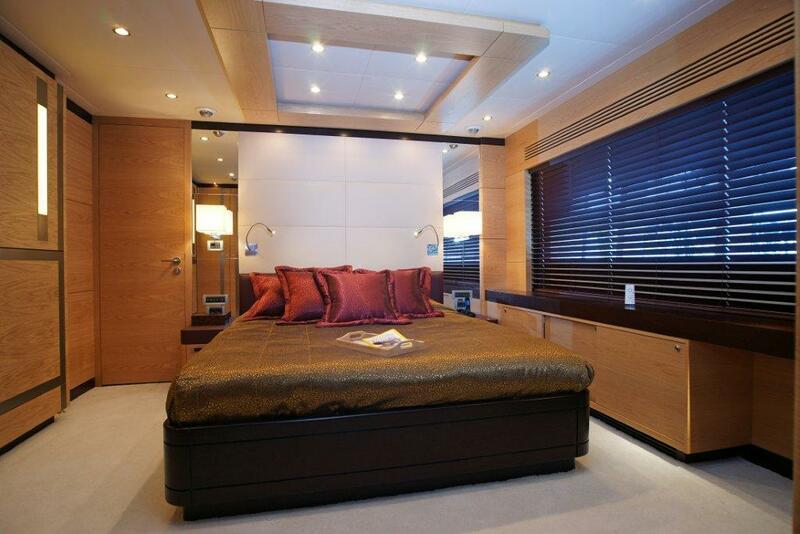 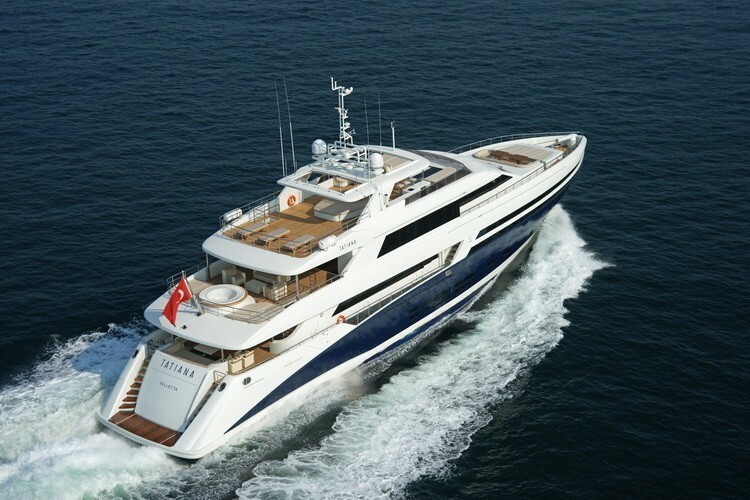 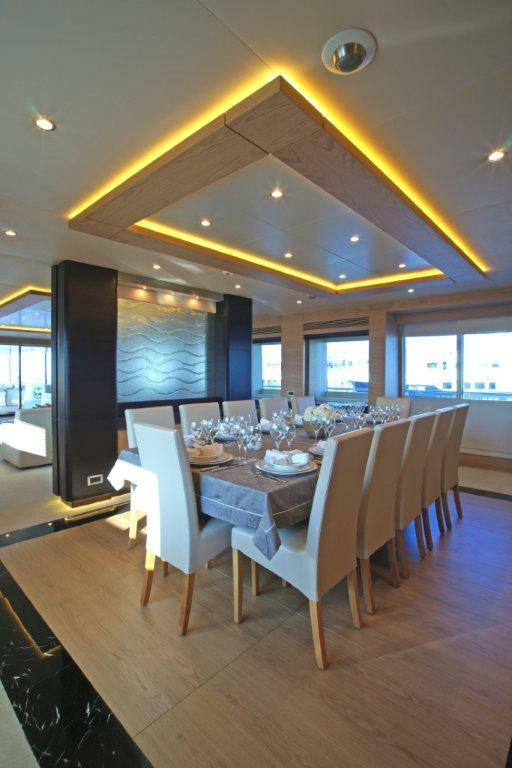 Tatiana motoryacht accommodates up to 12 guests, in a Master Suite, one VIP cabin and four guest cabins. 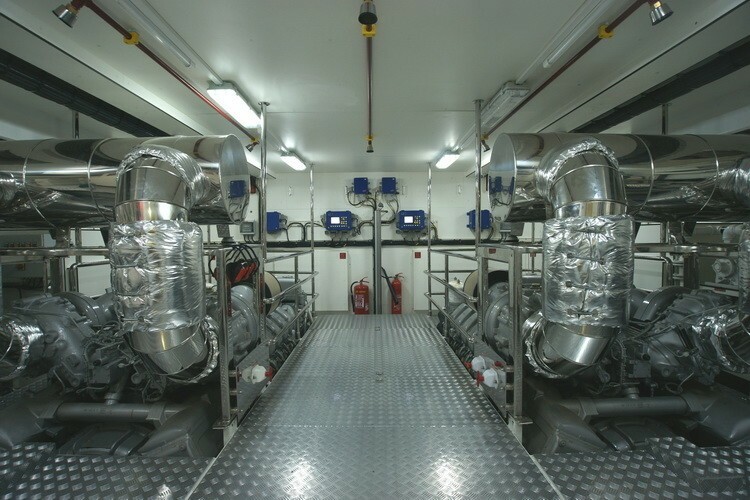 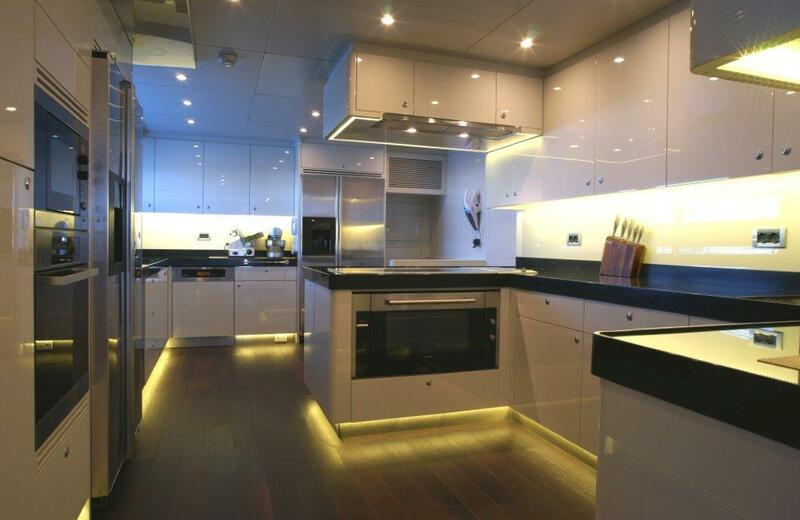 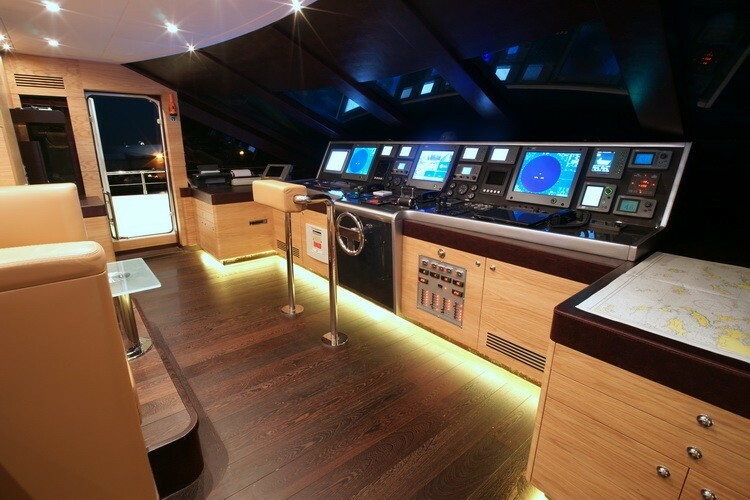 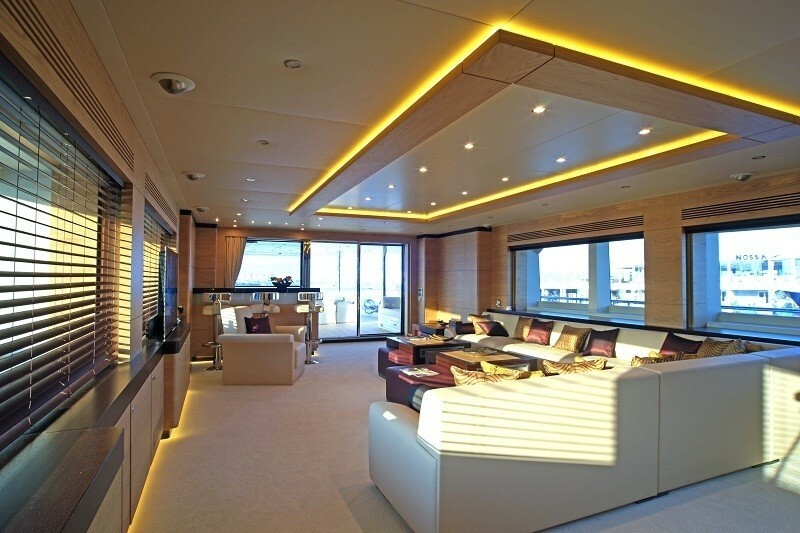 Eight crew are accommodated in four crew cabins in the bow area, including a crew mess. 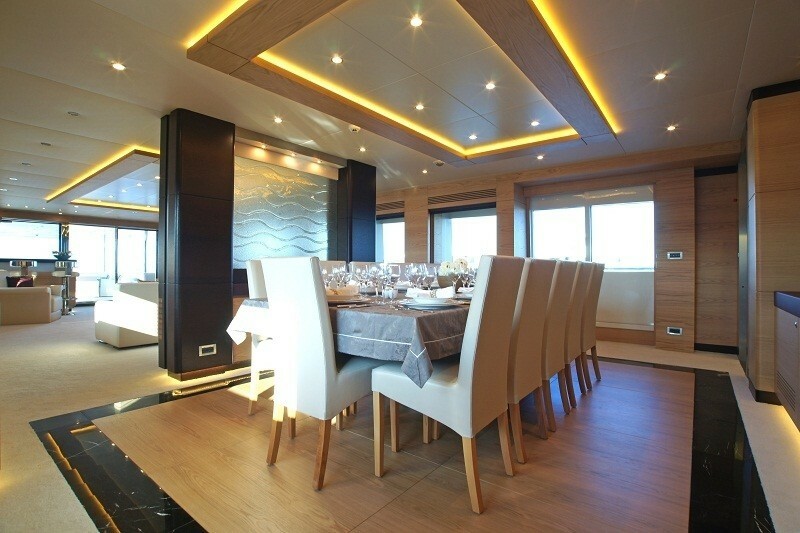 Motor yacht TATIANA offers a light and airy interior, the salon is surrounded by panoramic windows and features a generous L shaped cream leather sofa, coffee table and wet bar. 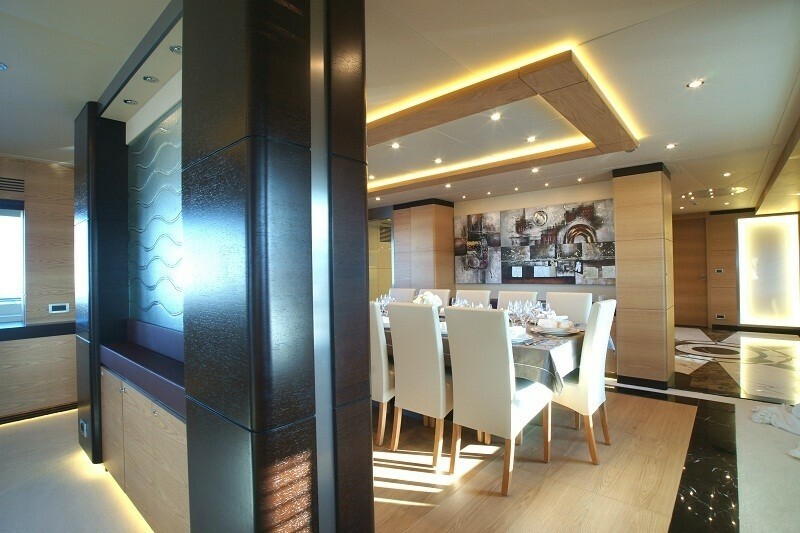 Forward of the salon the formal dining table is separated from the salon by a partial frosted glass wall, encased in fine dark leather. 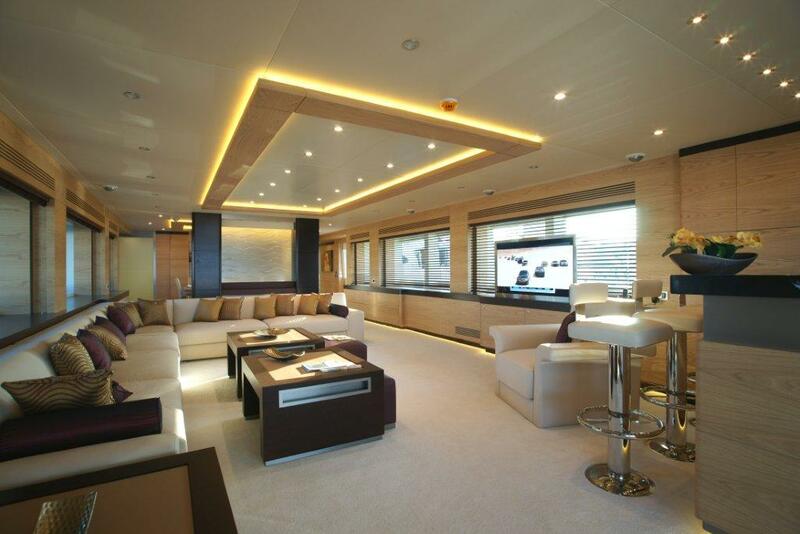 The foyer is on the starboard side forward of the dining area, followed by the spacious home theatre with massive flat screen and multimedia programming. 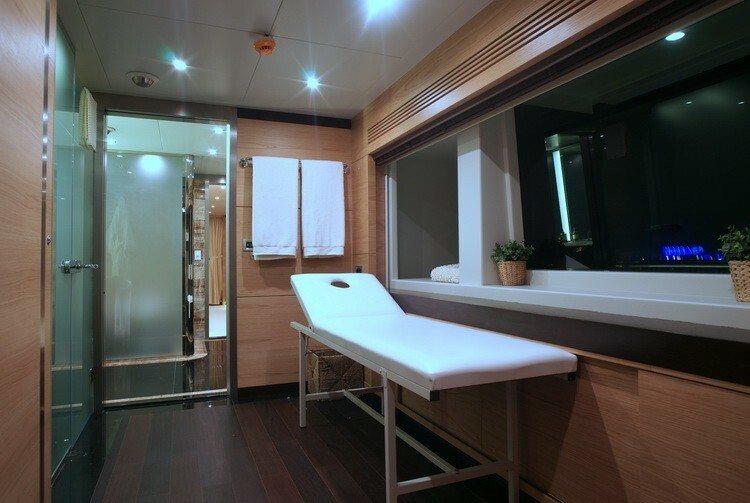 The VIP cabin is on the main deck, full beam of the yacht forward, with a center lined king size bed, sofa, vanity and generous en-suite with tub and separate shower room. 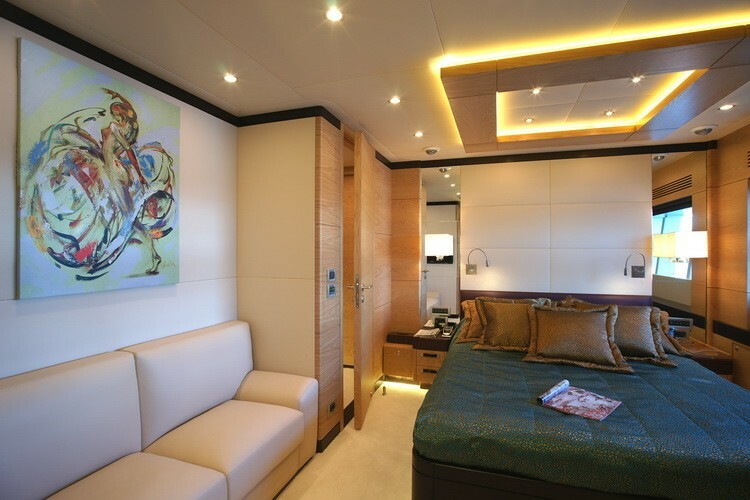 Bilgin yacht TATIANA is a tri-deck design, the upper deck is mostly laid to the full beam master stateroom with center lined king size bed, deluxe en-suite facilities, contoured lounge seating, spa and massage room and private office. 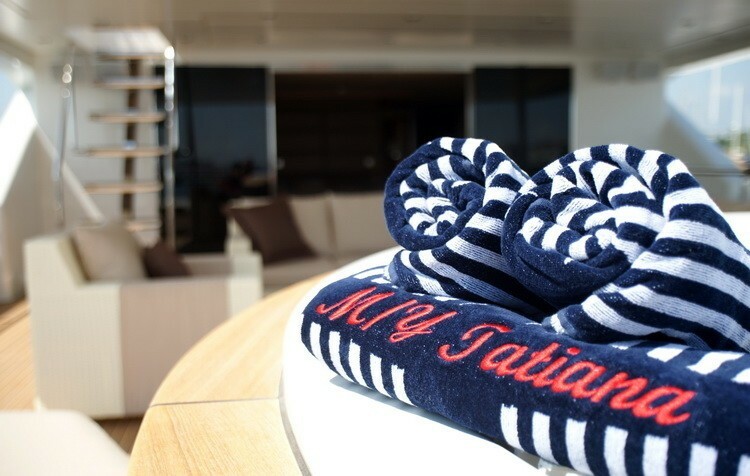 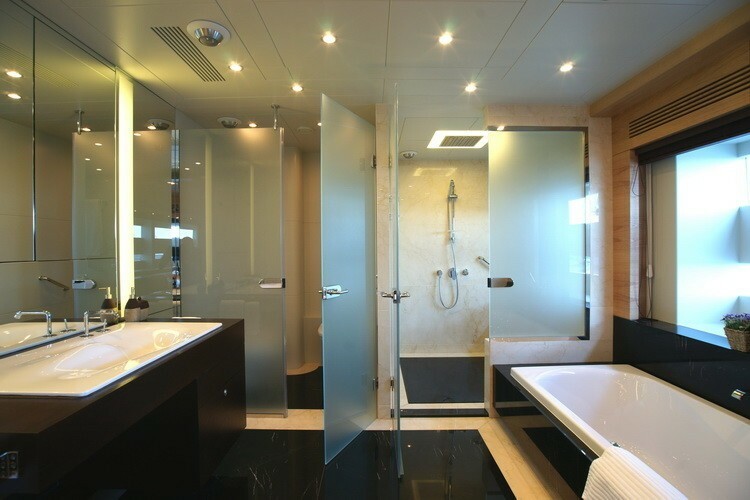 The master stateroom enjoys a private aft deck, complete with plush exterior seating, Spa Pool tub and sunpads. 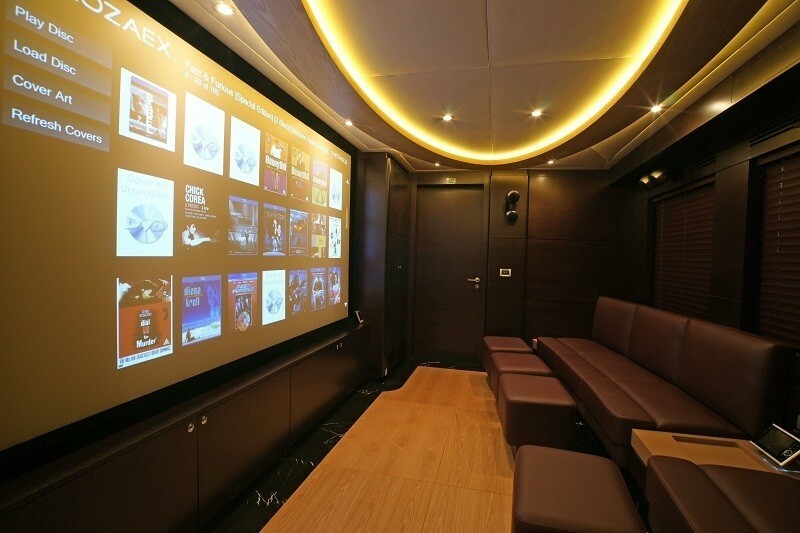 A versatile flat screen TV folds down from the cabin ceiling and pivots, to entertain either indoors or out. 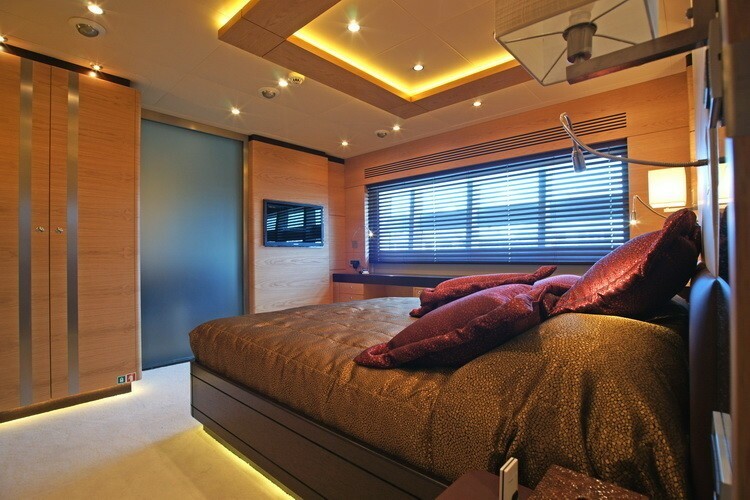 Further luxurious accommodation is in 4 en-suite double cabins below decks, all with king size beds, 2 with optional Pullman berths, ideal for children. 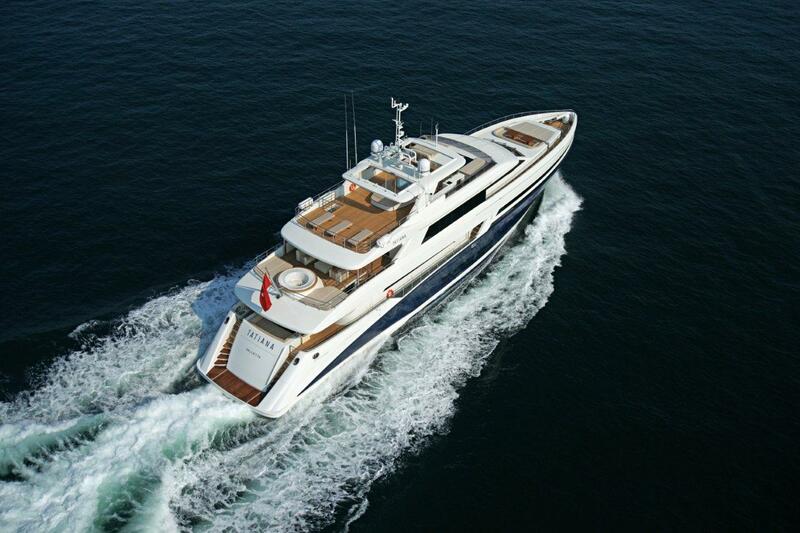 The design of the superyacht TATIANA enables ample exterior living on her 3 spacious decks. 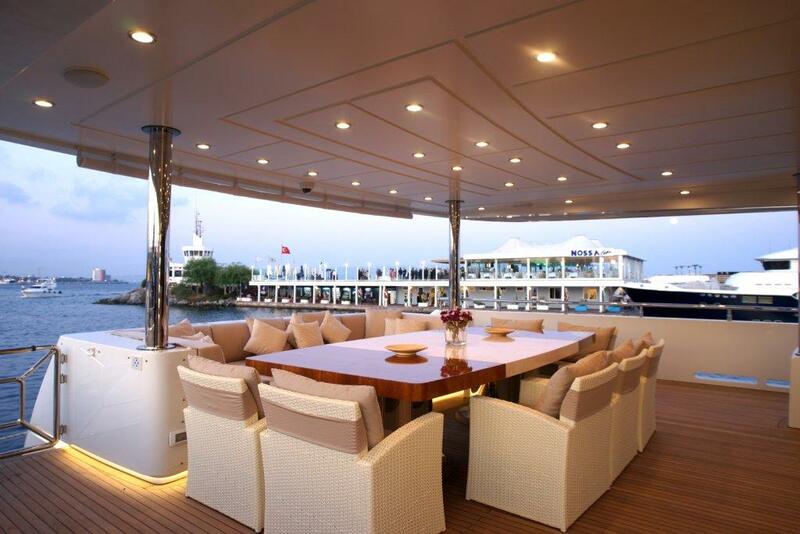 The main deck offers a large aft deck with an alfresco dining option, shade and easy access to the salon and wet bar, perfect for entertaining. 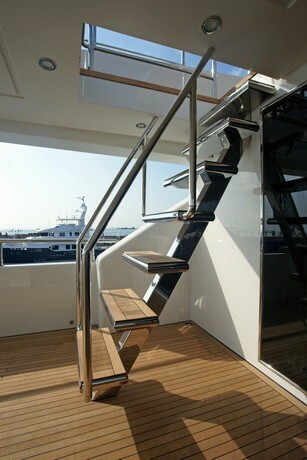 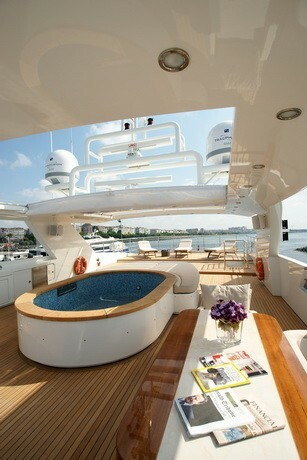 Guests wishing to enjoy the water toys on offer, will find the hydraulic lowering swim platform gives effortless access. 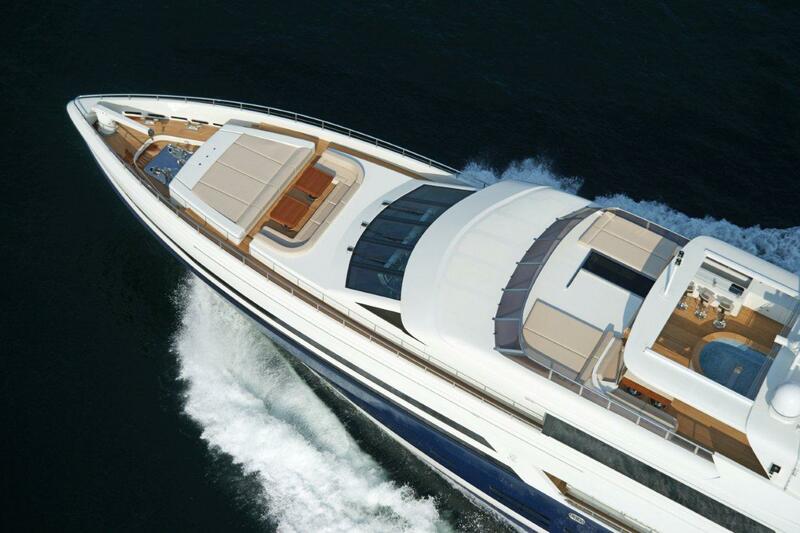 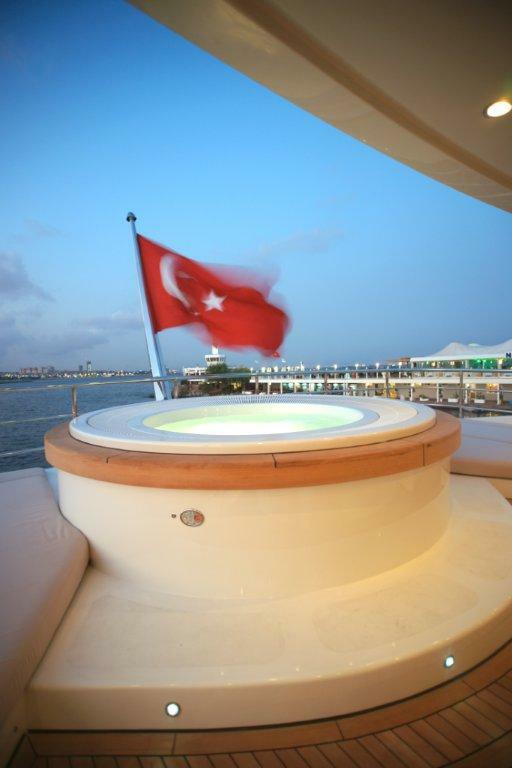 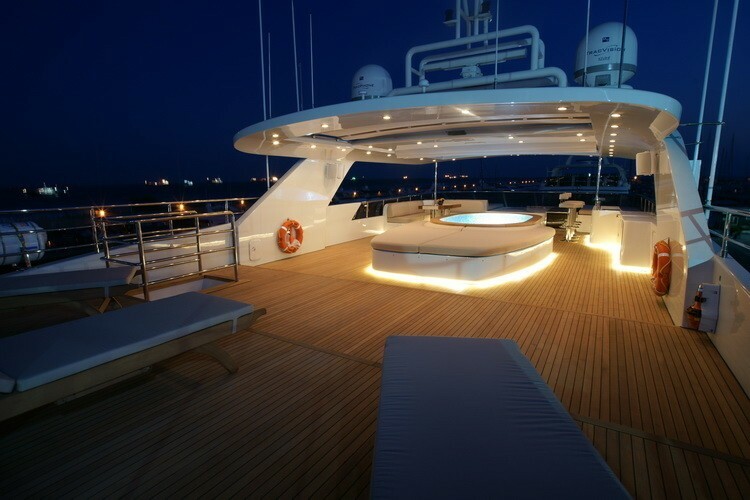 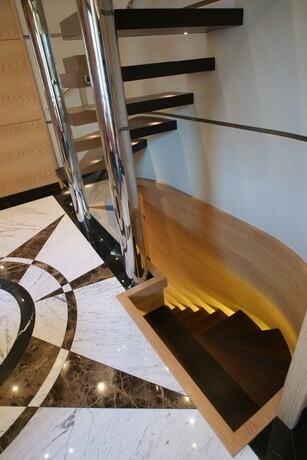 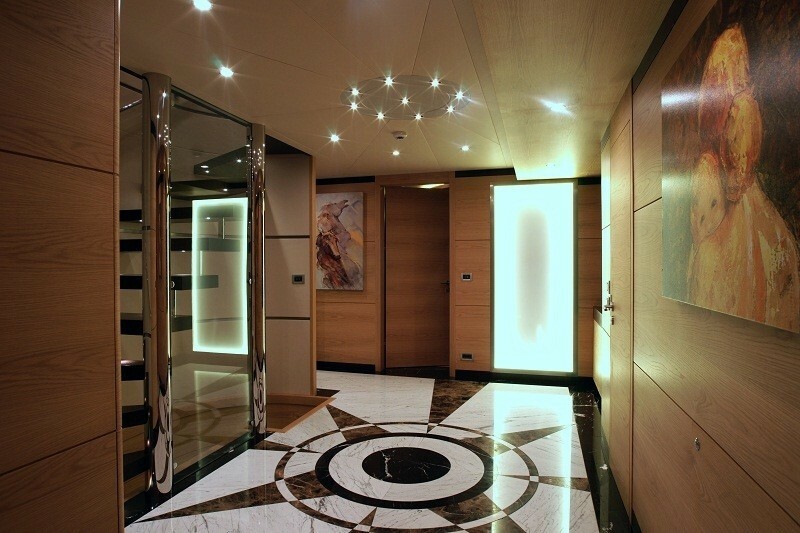 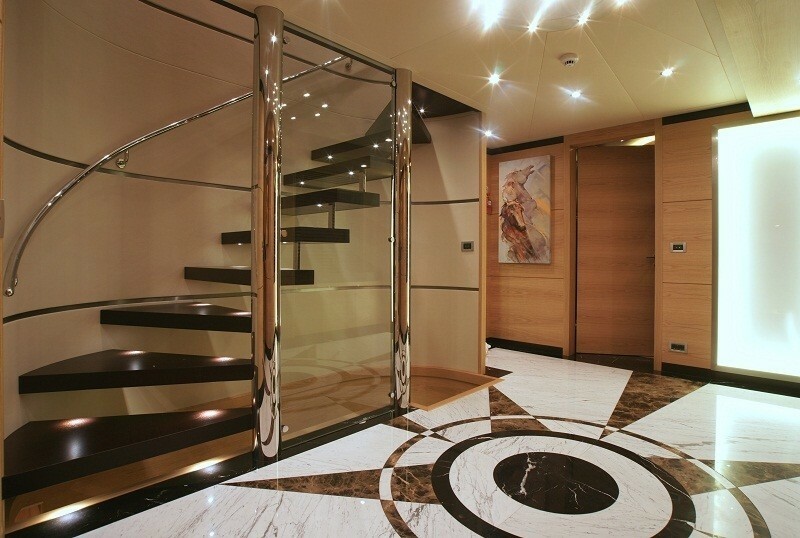 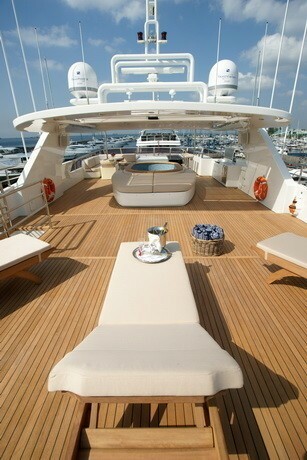 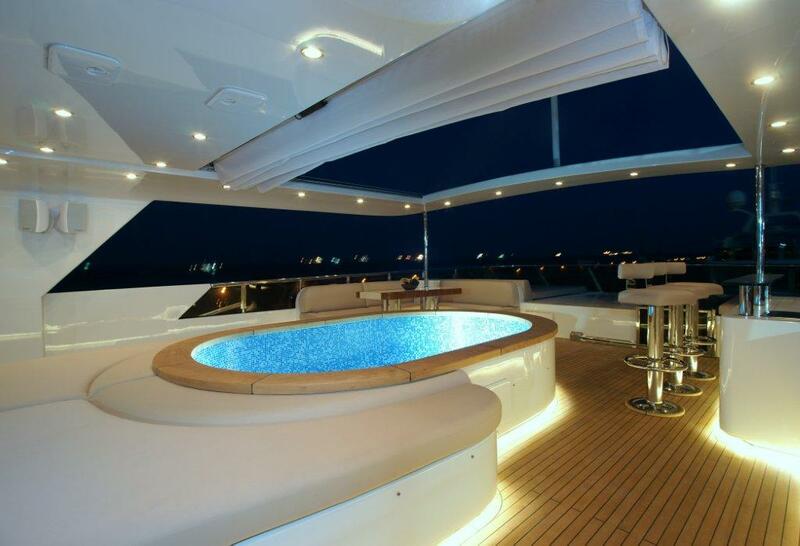 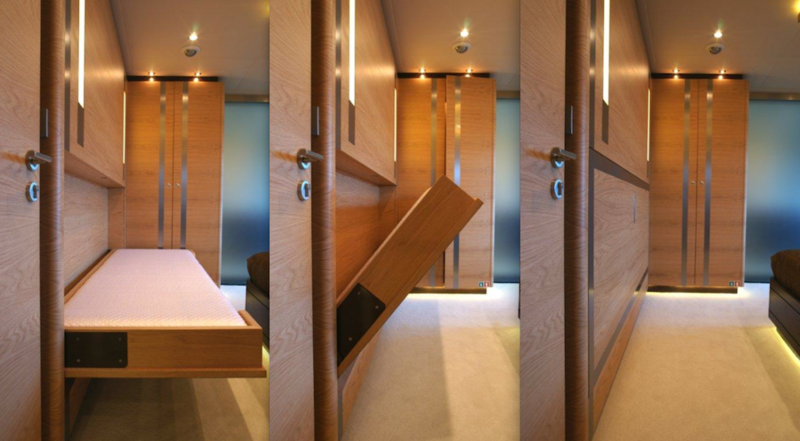 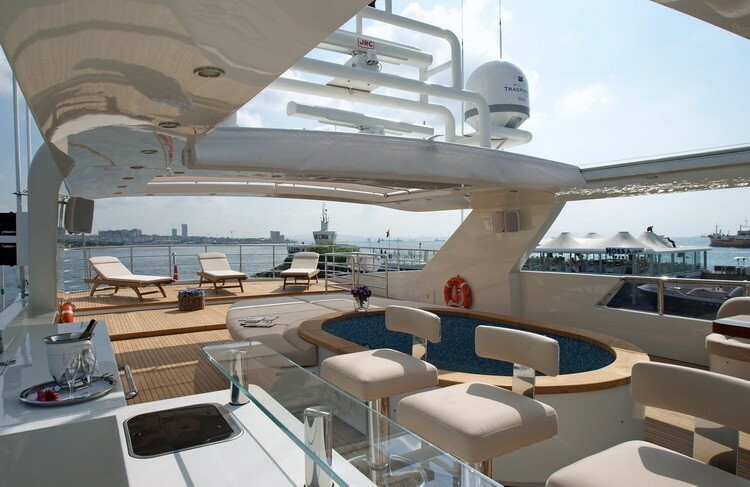 Above, yacht TATIANA’s upper deck features the master stateroom’s aft deck. 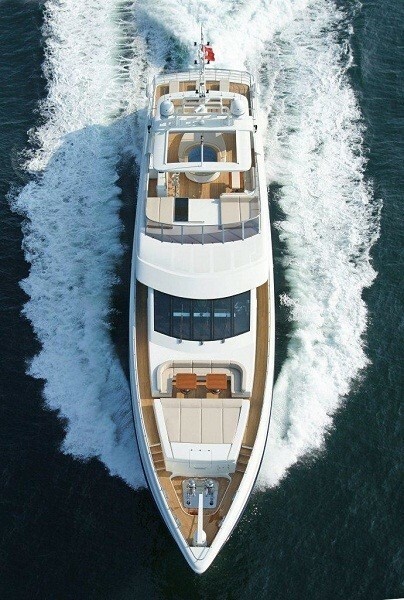 Forward and with separate access, the foredeck offers a large sunpad area and alfresco dining option for all guests onboard. 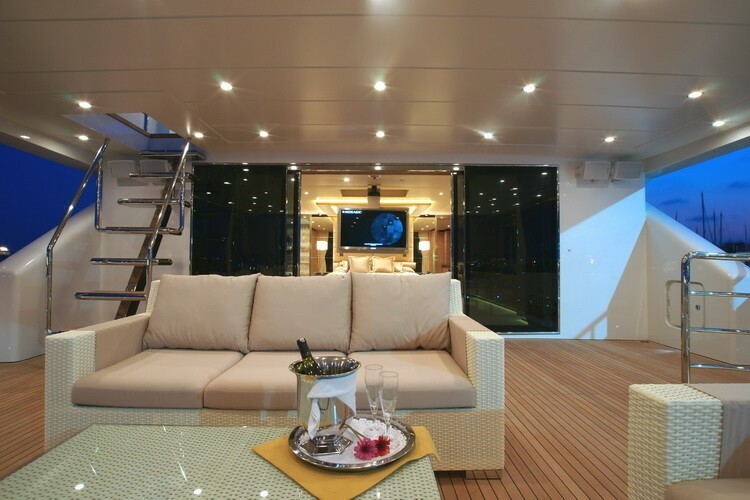 Luxury yacht TATIANA boasts a great sundeck above the upper deck, with chaise lounges, sunpads, wet bar, swimming pool, BBQ service area, small alfresco dining option and unique retractable partial shade, perfect for entertaining large groups day or night. 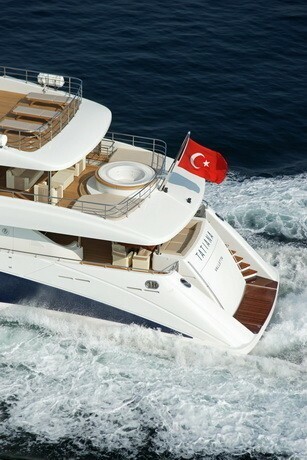 2011 Bilgin Yacht TATIANA is powered by two MTU 12V 4000 M93 engines reaching a maximum speed of 22 knots, with comfortable cruising speeds of 14 knots. 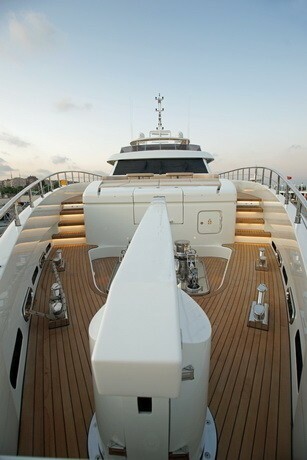 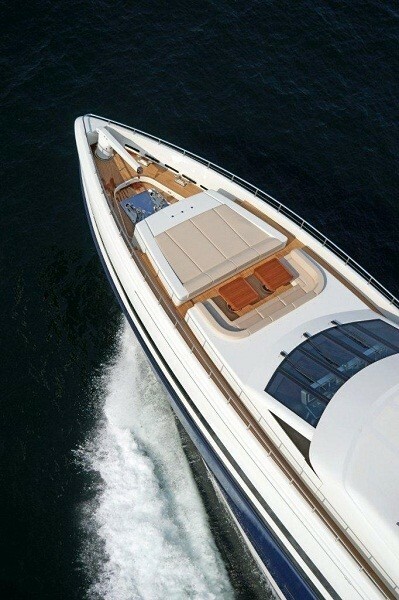 The yacht was built in cold molded technology, finished with west epoxy fiber and completed with Awlgrip paint system. 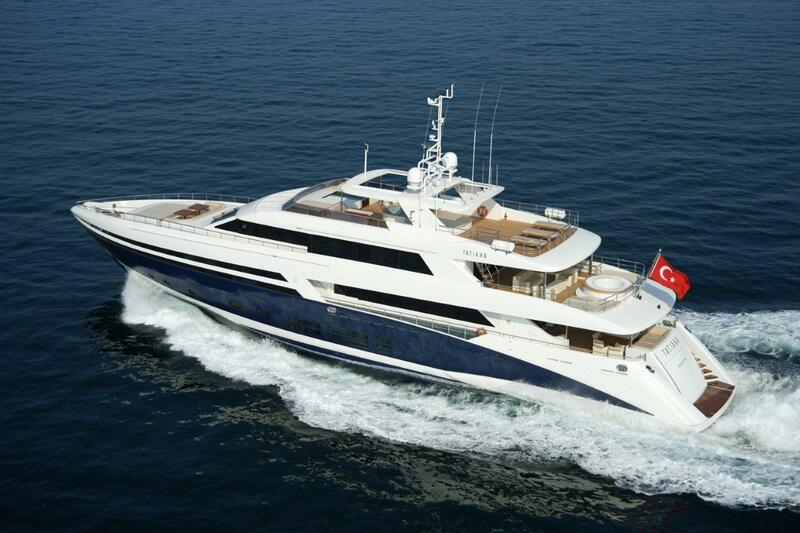 She has RINA Pleasure Craft Class plus MMA LY2 certifications. 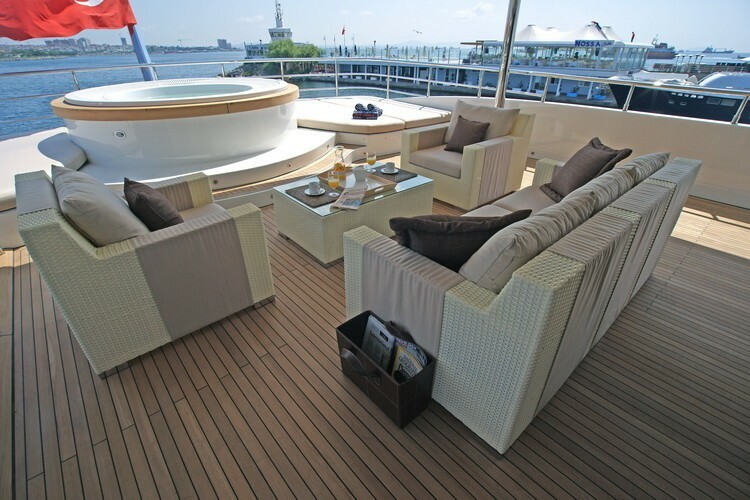 Zero Speed and Trac stabilizers ensure optimum comfort at all times. 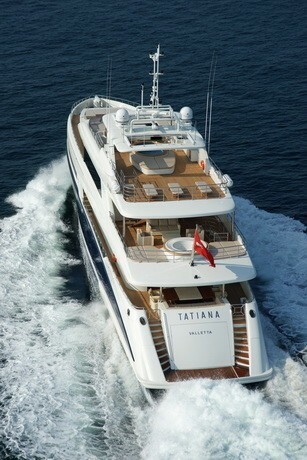 The Tatiana yacht is able to accommodate 12 guests in 6 Double cabins. 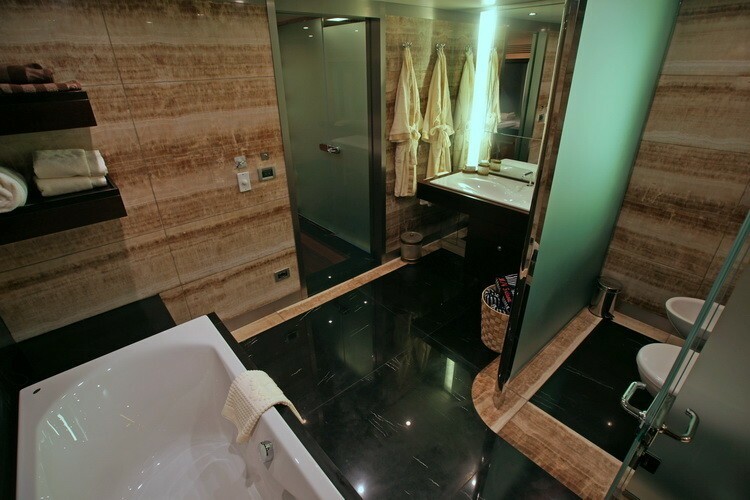 The master stateroom is on the upper deck with a full beam layout, 180° vistas, king size bed, spa and massage room, generous en-suite facilities and private aft deck with ample seating and Spa Pool tub. 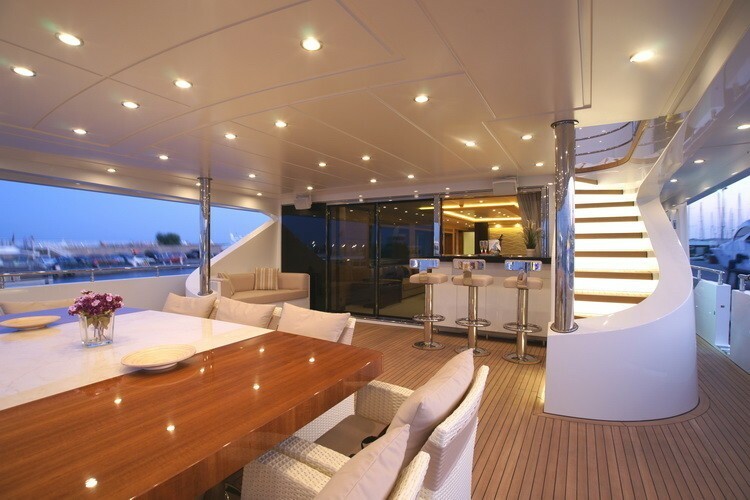 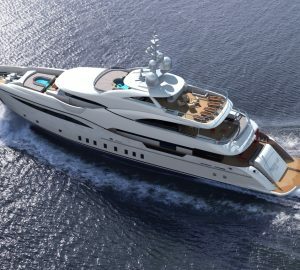 The VIP cabin is on the main deck forward and full beam of the yacht, with a king size bed, love seat and en-suite with bath and separate shower. 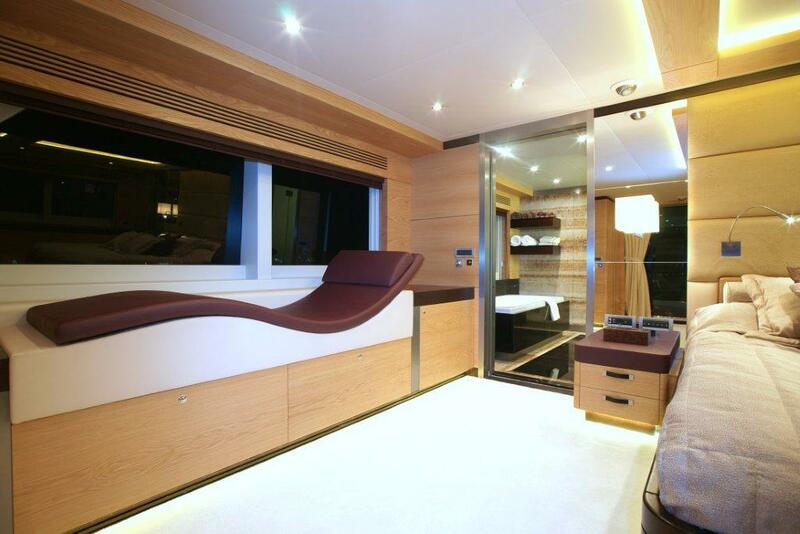 A further 4 cabins are on the lower deck, all with king size beds, 2 of which offer and additional Pullman berth each, perfect for children. 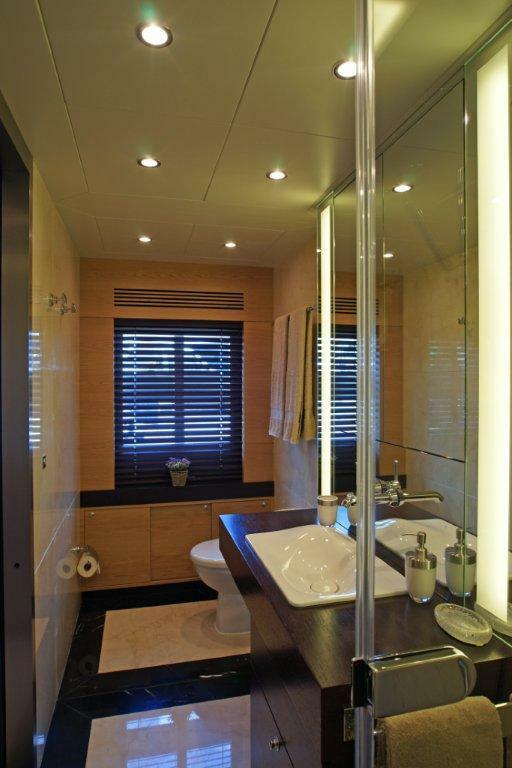 The cabins décor is simplistic yet elegant with a key emphasis on light and space. 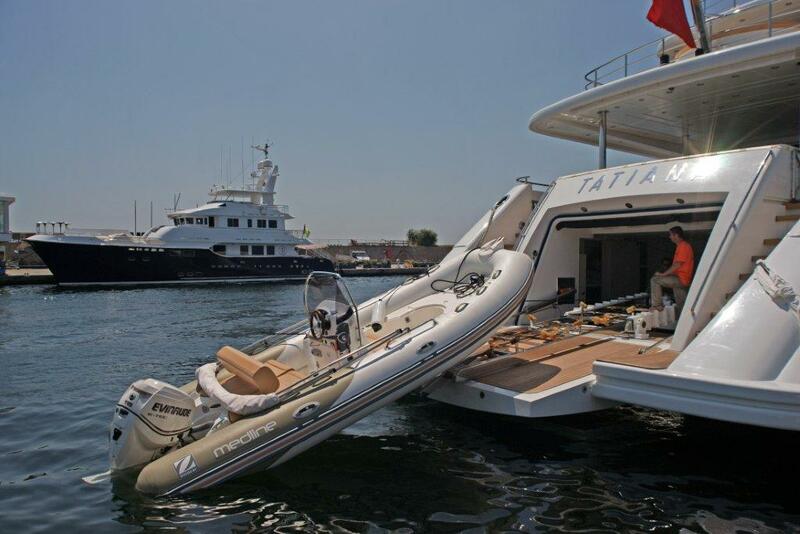 Motor yacht Tatiana has the following selection of Tenders + toys: 2 Jet Ski Yamaha Wave runner 3.10 meters, a 5.30m medlineboat with 115hp motor, 2 Ringo, a seabob cayago, Entertainement: 2 separate system for music onboard outside and inside.